Apple has launched the new Macbook Air with a few great advancements, which include the betterment in the processors, the new operating system and the addition of the Thunderbolt Technology. 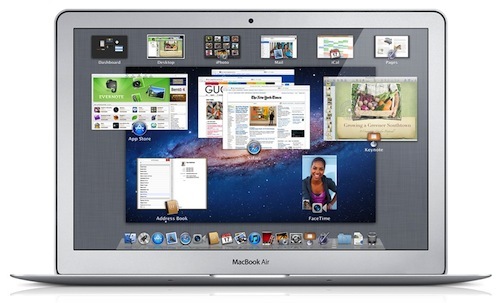 Retaining the Ultra thin Size and form factor of the 2010 models the newly unveiled 2011 Apple MacBook Airs will see the 11- and 13-inch models with a number of inner changes with an outer shell that measures just 0.11-inches at its narrowest point. And the 11.6-inch and 13.3-inch models will include 4GB RAM as a standard replacing the previous 2GB RAM, as it will improve the performance of Mac OS X Lion. Apple has added Thunderbolt port to the new Apple Macbook Air which promises to help you connect your Macbook Air to high-resolution displays and high-performance data devices through a single, compact port, and also this is supposed to be 20 times faster than USB 2.0 and twice as fast as the USB 3.0. With speeds of transfer reaching upto 10 Gbps. Macbook Air is coming equipped with a 1.8GHz dual-core Intel Core i7 and Core i5 Processors which is the best is being codenamed “Sandy Bridge”. This low-voltage chip is inline with the Macbook Air’s predecessor, and the chip’s ability to process graphics cuts the need for other chips, enhancing battery life. Apple says both versions of the MacBook Air should last 30 days on a single charge in its Standby mode, which is roughly equivalent to a PC’s Hibernation mode. The Macbook Air 2011 battery got discharged just after 4hrs of wifi usage unlike the Apple’s hype of a 7 hr’s battery life. I think Apple has retained the same Battery from the previous model but with the increased specifications and the inclusion of Thunderbolt feature which i guess eats up a lot of battery looking at its performance. In fact, the only really noticeable difference externally which is highly noticeable is the backlit keyboard at night, where the brightness can be increased or decreased using the F5 and F6 keys. This is one feature that many users complained was missing in last year’s revamp. That’s because it was previously available on older Air models other than the 2010 models. With the inclusion of Intel’s Sandy Bridge processors, the latest generation of the MacBook Air even the 11′ and 13 inch Laptops offers performance that, not long ago we could see only on the much more expensive and bulkier MacBook Pro laptops and shelling out close to 2 times the money whcich we can now pay for the same speed and performance. And coming to the little tweaks and tricks which the new Mac OS X Lion gives us is by giving a pinch with three fingers and your thumb on the trackpad automatically launches the iPad-style Launchpad menu for accessing your apps, while a three-finger swipe up launches Mission Control, which gives you a view of the Running programs in the background.